The thing which I really loved but which is now completely out of my access is fruits. 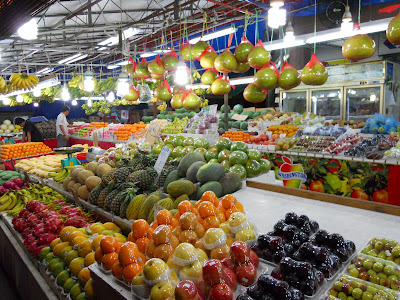 Singapore gets the best fruits from all the surrounding countries of South-East Asia. First, you get amazed by the variety itself, then you start trying and picking your favorites. Google is full of "top 10 exotic fruits" lists and the like. However some of the best fruits are not at all covered. All attention goes to durian. Do not get me wrong though. I'm one of those who like it. So here is what I'd try if I was in Singapore. I'll do it again when I'm back there. Go to Geylang road preferably at night. Find the fruit market (if you ask your taxi driver something like "Geylang, durian" he will normally take you to the right place). 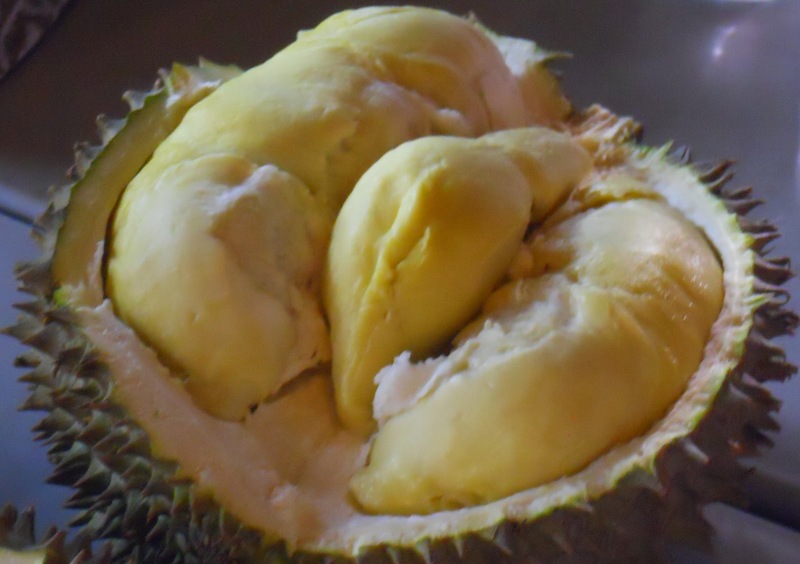 First, get the most expensive durian you can find. In 2010 they were sold at around SGD20-30 per kilo (if you get the whole one, which is fair if it's no less than 4-5 of you) or 15-25 per package of freshly cut durian. 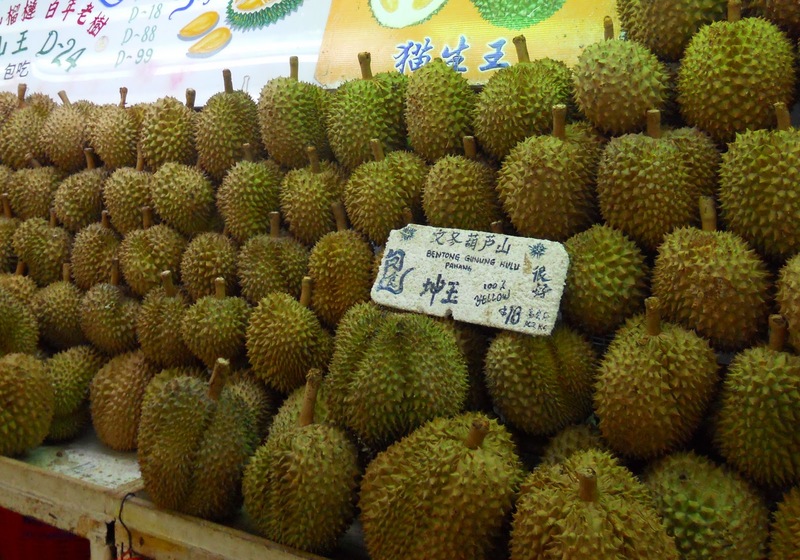 Do not try to save money on durian. Almost surely you'll end up hating the cheap one. Have it right there. There is no convenient way to transport it somewhere (you won't be let into a taxi with it). The street tables and trash bins look disgusting, I know. Just try it once, you'll forget about the setting as soon as you concentrate on the fruit. Wash your hands in the tap provided. Sugar apple - is my absolute number one. Shame on me, I do not have a photo, but follow the link to check it out. Pick big ones that are a little soft and still green. If it has just started to turn dark it's also fine. Just do not take those completely black. Sugar apple is incredibly reach in both its flavor and its texture. The flash is white and chewy with a touch of some flowery taste. Cut it in half and then into segments, take out the pits (they easily get out) and enjoy. I was never able to stop before I finished the whole half a kilo thing. 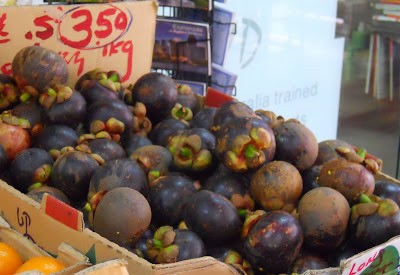 Mangosteen - here I'm not too original. Most of people seem to like it. 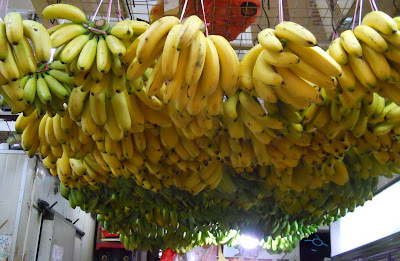 The ripe ones are normally dark purple or starting to turn brown. The rind is hard, but a little springy if you press. My friend once made great fun of me when caught me using a knife to open a mangosteen. Use your fingers to press the rind. The fruit will crack in half and you'll easily get the flesh out. It is so juicy and flavorful I can't even tell you. Dragon fruit is really pretty and refreshing. It has very subtle flavor. The one which is purple inside is normally sweeter than the white one. Take it out of your fridge, cut in half longwise and eat with a teaspoon. And give the second half to some really nice person. Or leave it for yourself. I'm not going to talk about mangos, pineapples, bananas and the rest. All are great. As if those I tried before were taken to the power of two. Interesting is that best fresh juices seem to come out of completely different fruits, which are not to good on their own. Sour sop - you'll rarely find sold as a whole fruit, but you'll see it all over the place as a fresh juice and in ice shops (its flesh is part of shaved ice desserts, often with coconut cream and other nice things). 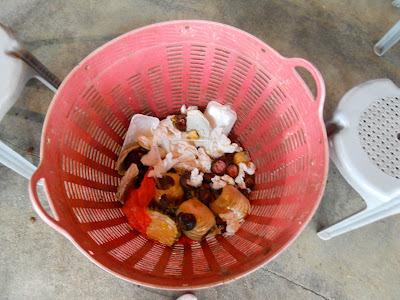 Balonglong - is greatest fresh I tried. It is almost savory. Sour and a bit salty. It's hard to find though. I got it only once in a street foodcourt on the corner of Commonwealth ave and Holland road. Star fruit - freshest and lightest fresh though the fruit itself has literally no taste. 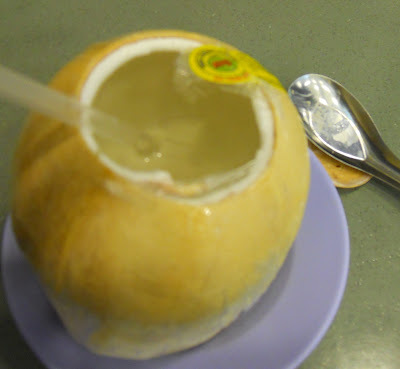 The last thing I'm going to say is that Thai coconuts were the best of those I could get in Singapore. They are normally packed this way, which makes them easy to distinguish. Their juice is much sweeter and creamier than that of bigger green coconuts. The flesh is always present and is very rich and flavorful. Coconuts are a matter of taste though. You might easily like those from Indonesia (big and green, more sour in taste). Some of these Singapore fruits are available in the Moscow Eliseevsky store. Last time I saw the mangosteen, dragon fruit, tamarillo, lychees, kumquats there (not mentioning mangoes, pineapples etc). They are not as flavorful as to survive the transportation they get picked ahead of time. But it's still nice to have them at hand. As for my favourite juice, it is honey dew, for its creamy, sweet flavour that easily boosts your mood. However,Sour sop became my first option since you introduced it to me @Ayer Raja food court. I had it with chilly/pepper crab@ jumbo seafood and it really broke down the strong taste. 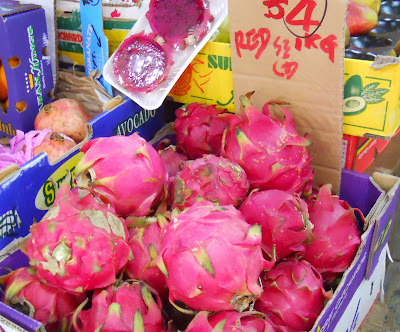 Oh, I never tried dragon fruit after spicy food! It must taste great... and probably alleviate the heat. I don't even know when I get my next chance to try.